Here’s the thing with Black Phoenix Alchemy Lab (BPAL). It’s got a fragrance library that numbers into the thousands and is still growing to this day. It’s got a huge following with a huge set of fragrances spanning every single fragrance family you can think of and everyone reacts and has a slightly differing opinion of every fragrance because the oils smell different on everybody. This entire blog could be dedicated to just smelling and seeking out the entire BPAL library. But that’s a monumental task. What better place to start than with a very simple, very well-loved bottle of Aglaea? Aglaea is a fruity, peachy, crystal clear and unfettered scent that brings simple joy to the table and all it expects back is the admission that, yes, it does smell like peaches. In Bottle: Sweet peaches with a very golden base and that slightly resinous scent mixed together. The musks must be very clear in this because I just can’t detect them at all. Myrtle seems like a lost cause because all I can detect in this is a very golden peach scent. Applied: The peaches flare up as fruit notes tend to do and then promptly take a backseat (quite characteristically) to the golden amber that takes center stage. If you’re looking for a complex peach scent that melds into woods and morphs into a bouquet of florals or fruits, Alaea will sneer. It’s simple, and it asks to be kept that way to the point where I don’t even care to look for the musk, though there is something very slightly “real” about this. Real as in, it’s trying to tell me I’m smelling white musk. Something clean and complimentary. Extra: Aglaea was the youngest of the three graces. Married to Hephaestus and spent most of her days prancing in green fields and being in famous sculptures and paintings such as Primavera by Sandro Botticelli. Design: I can’t say much for most BPAL bottles as they do tend to look the same with varying labels. You can see in the photo that it’s a very unassuming amber bottle with a plastic cap and a gothic-esque printed label. That’s really all it needs. Notes: Peach, myrtle, amber, musk. Black Phoenix Alchemy Lab is a young fragrance house that I can’t exactly file in the niche category. It sort of defies explanation in some ways so I prefer to call them a small and independent operation. Most of Black Phoenix Alchemy Labs’ fragrances are available on their website for $17.00 a bottle. Aglaea is a part of BPAL’s general catalog scents and is, therefore, generally expected to stick around in the foreseeable future. BPAL also comes out with limited edition scents. 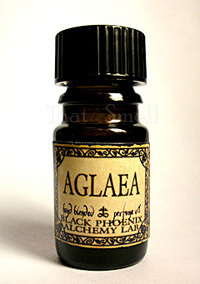 Reviewed in This Post: Aglaea, 2009, 5ml Bottle. This entry was posted in black phoenix, fruity, Reviews By House, sweet and tagged alchemy lab, amber, amber bottle, black phoenix, fruit notes, musk, myrtle, peach, sweet peaches, three graces. Bookmark the permalink.